With all of the great first-person shooters spinning in Xbox 360 drives this holiday season, BlackSite: Area 51 is bound to get lost in the shuffle. And unfortunately, that dishonor is deserved. 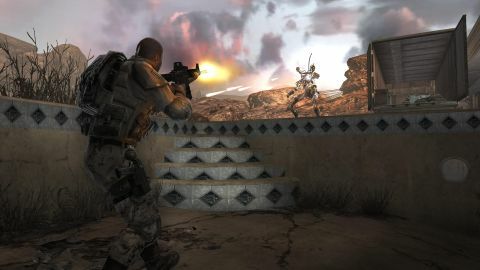 Despite impressive graphics and impressive demos that had us begging publisher Midway to move itsrelease date- which they did, but not far enough - BlackSite falls short in the area most crucial to any good videogame: gameplay. BlackSite attempts to combine its classic arcade rail-shooter roots (surging swarms of enemies, some of which are rooted in place so you can find their weak points) with more traditional first-person shooter action. Squad-based combat, perhaps BlackSite's most touted feature by developer Midway Studios Austin, falls apart thanks to crummy artificial intelligence. Squad mates typically default to running headlong into battle regardless of any orders the player provides. Other times they simply stand idly by, getting killed while the player does all the work. In theory, the "morale system" would give squads a performance boost if the player was performing well - but we didn't see much difference. Either there's no way to please theseingrates or it just doesn't work. Description Despite beautiful graphics, BlackSite falls short in the area most crucial to any good videogame: gameplay.